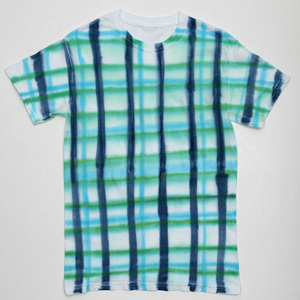 Lovers of plaid will adore the ease and appeal of this Impatient Plaid Tie Dye Tee from I Love to Create. Adorn this top in your favorite colors for a tie dye technique that results in a casual tartan pattern for every occasion. Learn how to tie dye a shirt that looks like this to wear on a staycation. Find this project and many more in our free eBook, How to Make Tie Dye Shirts, Decor, and More: 18 Tie Dye Patterns! Prewash T-shirt without fabric softener. Do not dry. Start with your widest brush. Dip it into Blue dye and work vertically from the bottom center of your shirt to the top. Using thinner brush add Teal vertical lines to the right of every other Blue line. Add Teal and Green horizontal lines randomly spaced apart. Rinse shirt in running water until water runs clear. Wash and dry shirt separately.